This Friday in Akron, legendary Akron band The Party of Helicopters will be playing a reunion-of-sorts at Thursday's Lounge. Also performing are Ghostman & Sandman, Ultrasphinx and Jon Finley (of Beaten Awake, Drummer, The Man I Fell in Love With fame). I couldn't pass up the opportunity to make a poster for this show! It's only a few days before Halloween, so the image is a mysterious haunted-house-esque cityscape in a classic spooky color scheme. 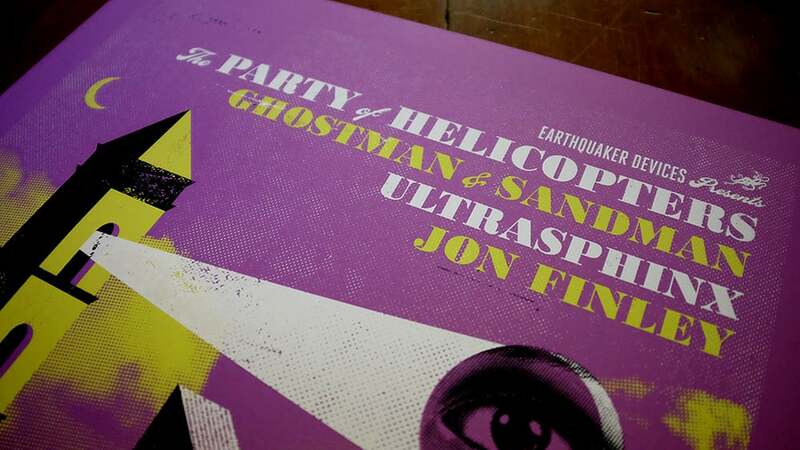 Limited to only 100 copies, and printed on French's limited-edition Vivitone Plum Punch paper! First available at the show, I'll have some for sale online on Saturday.